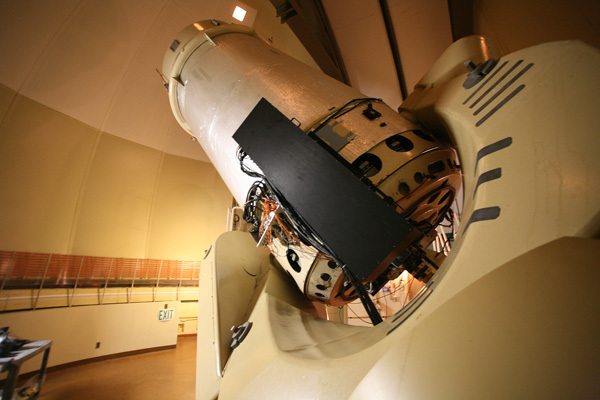 The Palomar 60-inch telescope, located in the Oscar G. Mayer Memorial Building, was built to take some of the demand off of the 200-inch Hale Telescope. It was dedicated in 1970 thanks to a gift of the Mayer family and grants by the National Aeronautics and Space Administration (NASA) and the National Science Foundation. 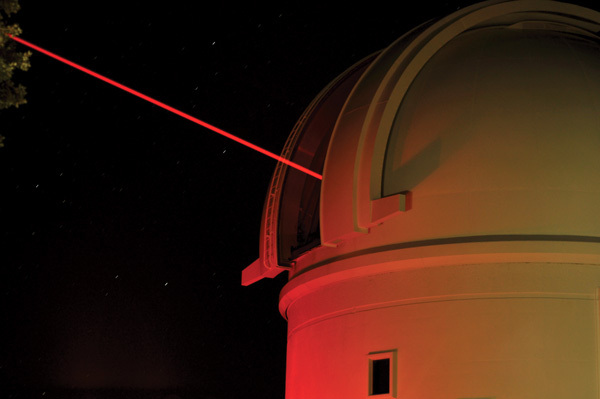 The 60-inch is currently operated robotically by astronomers from Caltech and partner institutions. In addition to being used for follow-up observations of potentially interesting astronomical phenomena first detected by sky surveys or by other telescopes, the 60-inch is a platform for testing new instrument technology. The information on this page is intended for the public. Observer information for the 60-inch telescope can be found on the corresponding observer page. Since 2004, the 60-inch telescope has operated exclusively in a robotic, queue-scheduled service-observing mode. Its automated system is designed for observations transient events— particularly supernovae, gamma-ray bursts, and other stellar explosions. In a similar manner to the Samuel Oschin Telescope, routine queue-scheduled observations can be interrupted in response to new transient event submitions on short notice. The data is reduced in real-time thanks to an automated pipeline; it is then stored on a searchable web-based archive for ease of distribution. The 60-inch is a reflecting telescope built with Ritchey–Chrétien optics, that is, both primary and secondary mirrors have hyperbolic reflecting surfaces. This configuration provides a wide field of view and relatively good image definition within a compact design—the telescope tube is only 150 inches (3.8 meters) long. The primary mirror weighs 2,000 pounds (907 kg) and its thickness varies from 10 ½ inches (26.7 cm) at the outer edge to 9 inches (22.9 cm) at the center. The telescope has four additional mirrors and a corrector lens. A 18-inch (45.7-cm) central hole in the primary mirror allows starlight to reach the Cassegrain focus (f/8.75) with a 525-inch (13.3-meter) focal length. The telescope design also allows it to be operated using the coudé focus (f/30) with a 1,800-inch (45.7-meter) focal length, though the coudé focus was never used and is presently decommissioned. The current instrument suite for P60 includes a general-purpose optical imaging camera and a specialized "integral field" spectrograph, both mounting at the telescope Cassegrain focus. 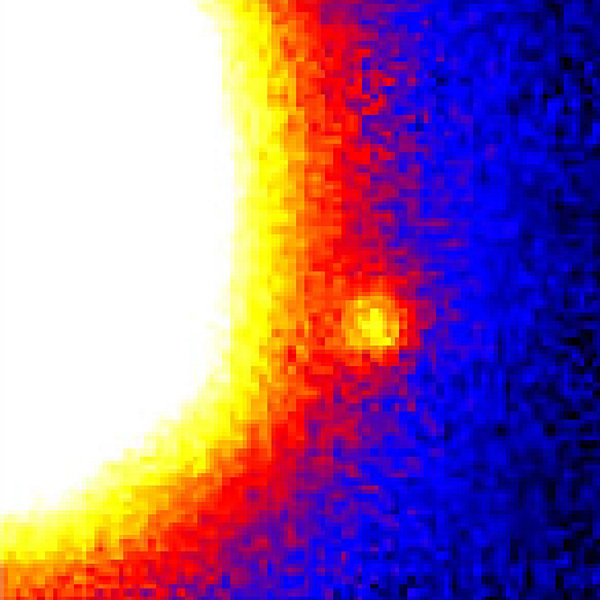 The optical imager uses a 2048×2048-pixel CCD array camera to image roughly 13 arcminutes of sky on a side. Similarly, the "Spectral Energy Distribution" Machine (SEDM) integral field spectrograph images the sky over a comparable 10 arcminute field in four bands. But SEDM also images a smaller 30-arcsecond field and simultaneously takes low-dispersion spectra for sources in that field. The ability to obtain low-dispersion spectra makes SEDM ideal for initial assessments of unknown sources—particularly those identified in the Palomar Transient Factory arc of projects. 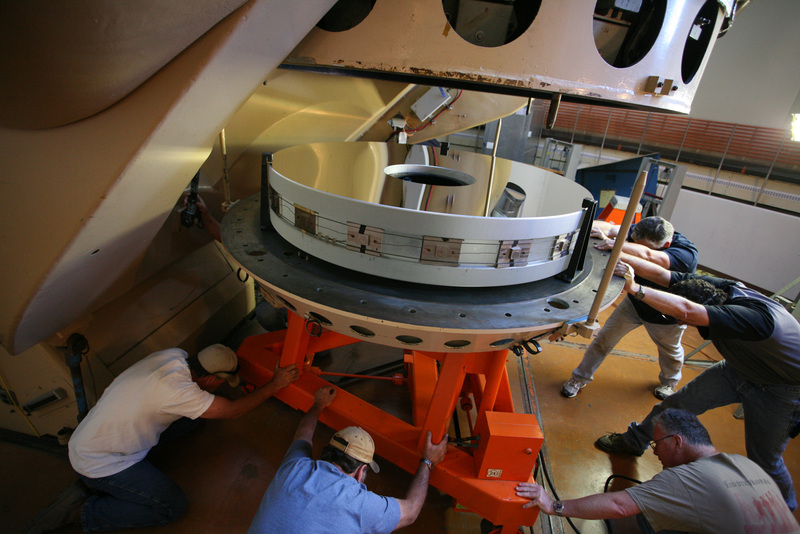 Planning for the 60-inch telescope began in 1962. The telescope structure was built with funds provided to the Carnegie Institution of Washington by the National Science Foundation. Chief engineer Bruce Rule was responsible for engineering and supervised its construction; the telescope was mostly built in the Central Engineering Services shops of Caltech. The 60-inch fused silica disk for the primary mirror was purchased from the Corning Glass Works with a grant from NASA to Caltech. Former director Ira Bowen designed the six-mirror optical system and further improved it by adding a correcting lens. The grinding and polishing of the optics were done by Floyd Day and the staff of the optical shop of the Mount Wilson Observatory in Pasadena. The Oscar G. Mayer Memorial Building, a gift of members of the Mayer family to Caltech, was designed by architect Richard W. Rose of Pasadena and built by Western Gear Corporation. The steel dome structure was based on the 48-inch telescope dome design including shutter operation, wind screen, and dome rotation mechanism. The 60-inch telescope was one of the first to be designed specifically for use with a computer. 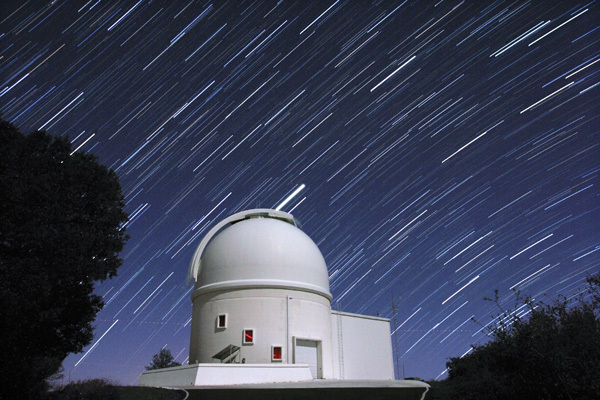 All engineering, programming, and fabrication was provided by the Mount Wilson and Palomar Observatories Astroelectronics Laboratory on the Caltech campus. The overall concept was due largely to Edwin W. Dennison, with system engineering by Howard G. Sachs and software by Donn M. Hall. A grant by the National Science Foundation funded the construction of both the computer system and the telescope's first auxiliary instruments. 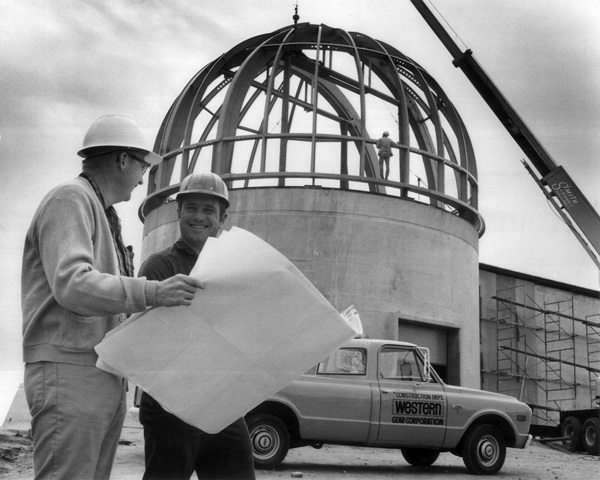 The 60-inch telescope and the Mayer Memorial Building were dedicated on October 23, 1970. The first brown dwarf ever to be indisputably confirmed, Gliese 229B, was discovered in 1994 using the 60-inch telescope with the Adaptive Optics Coronagraph—an image-sharpening device built by Johns Hopkins University. The brown dwarf, with a mass of 25–65 times that of Jupiter, is a substellar companion to the red dwarf star Gliese 229A in the constellation Lepus. The 60-inch telescope's role in Palomar's current scientific strategy is crucial, in particular as a robotic follow-up instrument for transients discovered with other facilities where immediate observations are critical. The 60-inch was used to observe a number of stellar explosions discovered by NASA’s Swift satellite. Among the studied objects were M85OT2006-1, a new kind of explosion called luminous red nova discovered in 2006 by Lick Observatory and followed up by the 60-inch immediately; the peculiar GRB 070125, a gamma-ray burst discovered in 2007 without a host galaxy; and SN 2008D, discovered fortuitously just as it was exploding. More recently, the 60-inch has also been used to obtain colors and light curves for interesting PTF-detected transients. 60-inch telescope graphical timeline ( go to expanded timeline). Time starts in 1950 and flows to the right; use the scroll bar to reach the 2010s. Each column corresponds to a decade, vertical lines indicate years. Darker background shows when the telescope was operational. Each event is shown as a bar whose width indicates time span. Hovering with mouse over an event will bring up a short explanation. Hint: use the keyboard shortcuts (no shift) control/command + to zoom in, control/command − to zoom out, and control/command 0 to reset. The media section has additional images of the 60-inch telescope.